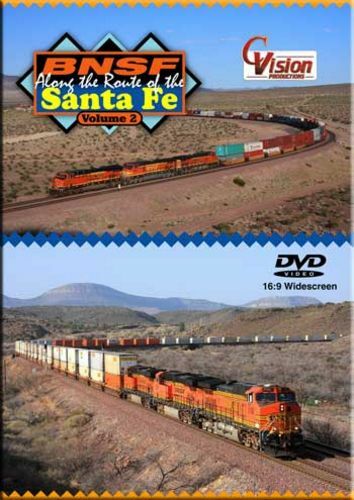 Journey along with C. Vision Productions as we explore the former Santa Fe main line in Arizona and California. Videographer Kenn Oberneder captures the action on this super busy transcontinental main line from Seligman, Arizona to Ludlow, California. Next to the famous Route 66, this main line is known as one of the busiest sections of railroad in the United States. Along with tons of railroad action, you will see fabulous desert scenery, which captures the essence of this magnificent landscape. We visit locations such as Crozier Canyon, Kingman, Topock, Essex, Siberia and more! This show was captured in the spring of 2011, a time when strict emission laws were in place in the state of California. As a result, BNSF uses a majority of its emission friendly ES-44 locomotives, however, several older locomotive models are still present throughout the show. 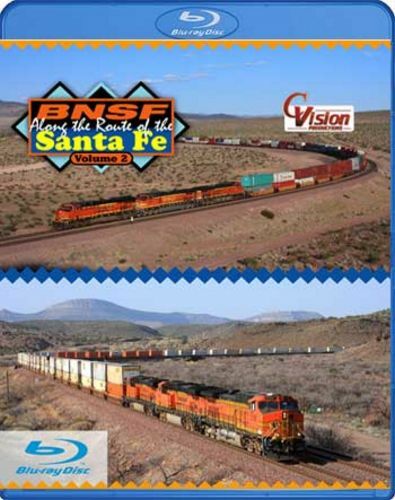 Don't miss this C. Vision Productions program as it showcases one of the busiest main lines in the country in �BNSF, Along the Route of the Santa Fe, Volume 2�! yvon st marseille (montreal pq cda) on 2012-04-10 15:51:40. Thank you for sending me a second blue ray because the other one seems lost in transit. This video disappointed me maybe because of the way it was filmed. Too long for nothing I dont recognise where it was filmed not much about Needles and nothing about Barstow ca.